Clocks changed, check. Weather warming, check. Lighter layers, check. Move over oatmeal, you’re so wintertime, and I’m feeling spring in the air! I’m so excited to share my favorite spring smoothies, in green, pink and orange to celebrate the season. 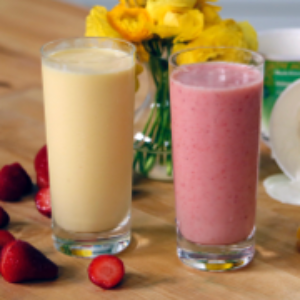 For breakfast or snack time, these smoothies are like sunshine for your soul. Hemp is a complete protein and a much better choice than the protein powders you find on the market. It is neutral in flavor and makes for a thicker and more satisfying smoothie. Paired with pineapple and kale, this quencher is an antioxidant powerhouse. Load all of the ingredients into the blender and blend until smooth. Enjoy. If you are a berry lover, good for you! Full of fiber, vitamin C and cancer fighting compounds, berries are great fresh or frozen. Paired with the dairy, they help to absorb calcium in the most delicious way. Again, ditch the fake protein powder for real food ingredients, they’re more readily absorbed and less taxing to your kidneys and liver. Load all of the ingredients into the blender and blend until smooth. Enjoy! Nothing invites the feeling of sunshine like tropical fruits. Mango and orange pair together here for a refreshing and healing elixir. Mangoes are famous for fighting infection and immune boosting properties and oranges can’t be beat in fiber content and vitamin C. Pull this recipe out when you’re fighting a spring cold or need a little added pep in your step.